Solid Wood Slab Furniture Handmade In Northern Virginia. Log to Furniture Onsite using only recycled wood from construction sites, there is no such thing as wasted wood at our shop. We are not your average furniture factory. Log to furniture as green as possible. We sell slabs and Lumber for any project. If your into wood and woodworking you need to discover us. Eco-Friendly Lumber recycling keeps tons of waste out of are local landfills. All of our lumber is produced from trees locally salvaged from construction sites in Northern Virginia. 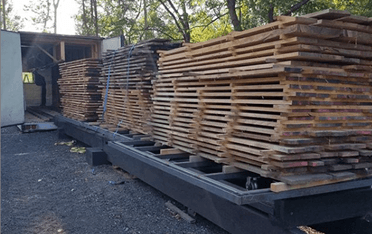 All of our Lumber is produced from trees locally salvaged from construction sites in Northern Virginia. We save these trees from the chipper or grinder. Then we recycle these logs into beautiful lumber and slabs with our fuel efficient sawmill. We dry the lumber with a state of the art kiln, all onsite therefore reducing transport energy. We are not your average furniture factory. Log to furniture as green as possible. We sell slabs and lumber for any project. If you're into wood and woodworking you need to discover us. We offer custom wood products any size up to 6ft wide. Bar tops, table tops, rustic and reclaimed lumber for any design. If we do not have it in the size your looking for we can make it. We have a great selection of wood products and the best prices around. Come out for a tour and check out our great prices. I love the Lion carving on the American Holly that I bought as a gift. My dad loved receiving it, and he was able to hang it immediately because Eco-Friendly had already fitted it with mounting hardware! Wonderful craftsmanship, and friendly customer service...definitely coming back! Beautiful lumber! Super friendly and will come back! Very knowledgeable and helpful team, the guy who helped us located the perfect pieces for my project. I couldn’t be more happy with the service & selection of unique walnut for the perfect project! I went to Eco-Friendly Lumber to get a piece of wood for some floating shelves in my living room. I needed pretty specific dimensions, and they were able to provide it. They have a great selection and are very easy to work with! Thank you! Beautiful work, fair prices, and amazing talent. Use them for your next project and I guarantee you won't regret it! Can't wait to install our new desk from Eco-Friendly Lumber. Pictures to Follow! I just purchased two live edge slabs for our kitchen island. Fantastic service; I contacted them via facebook to ask a question way after business hours and Scott got back to me within minutes; when I went to look at the available pieces, Scott took the time it needed for me to select, call my husband, send pictures, and ask questions. Overall, a great experience. Knowledge of woodworking is apparent as they helped me with my oak round table project. Thanks! All I can say is 'wow'! Russell is wonderful. I had no idea what went into cutting a log into useable pieces. 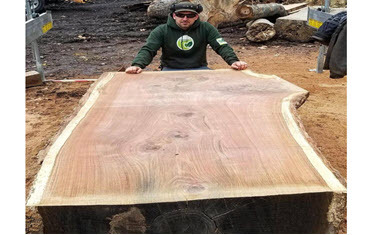 We had to take a huge old white oak down, and we wanted to incorporate it into our home, so Russell explained that he would try to get the best pieces out of it. We couldn't be happier. After seeing the labor, time and expertise it takes to produce wonderful pieces, it was well worth it. Thank you, Russell and the guys at Eco-Friendly Lumber. What a neat place! Got a new kitchen table from here. Great prices and great service. Great source! Russel showed us around and helped find the perfect slab for my project. Looking forward to coming back for the next one. Russell is awesome. 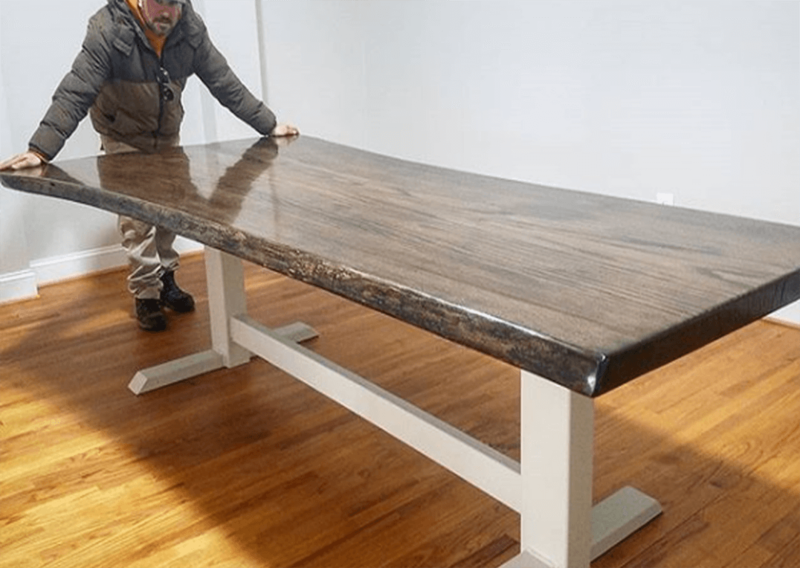 He custom made our oak dining table and it looks amazing. Russell was awesome! Looking for some live edge shelves and he helped with finding a piece that he plained and cut to size - beautiful. Ever since I discovered this place, I went back several more times buying more stuff. The walnut bar top is gorgeous! Thank you Russell Martin! I was surprised by the huge selection of hardwood here! The quality was top rate and the prices were unbelievable not to mention the outstanding customer service. You are doing yourself a disservice if you do not buy all of your hardwood at this wonderful business. I will definitely return for my next wood project! We LOVE our new curly maple dining table hand crafted by Eco-Friendly Lumber! These guys are awesome! I was looking for some wood to use as a beer shelf by my pool table. I found these guys and got some live edge walnut at a great price. When it comes to custom wood that's Ecco friendly this is the only company I would work with. Russle is amazing and he helped us with our restaurant at Courthaus Social. This Is Truly An Amazing Spot!! They Are A Dying Breed Of Artists & Craftsmen!! Been coming to EFL almost since he started and Russell is a great guy. Just wish I had more time to get in the shop to turn more of his trees inside out. Give us a call or shoot us an email. Better yet come visit us we are on site every day but Sunday! It is advised to make an appointment but not required.